DIN Standards are invented for a variety of components including industrial fasteners as DIN 124 Flat Round Head Rivets. DIN 124 Rivets are manufactured from Carbon Steel, Stainless Steel Grade A2 or A3, Brass, Alloy Steel, Copper, Plain steel or many other materials. DIN 124 Rivets are available in a wide range of sizes, shapes and materials. DIN 124 Rivet with a semi-circular head. Complies GOST 10299-80 and ISO 1051. 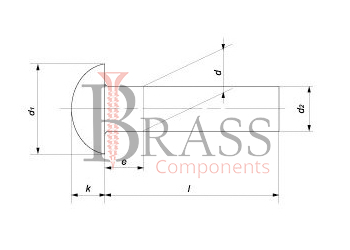 The design features of the DIN 124 Rivet allow joining sheets of different thickness. Preserves performance at critically high and low temperatures. High Corrosion Resistance and Oxidation Resistance. A high class of hardness of steel provides increased strength of joint. Installed using a hammer and a special tool with a semi-circular notch. The hygienic nature of material makes it possible to use for mounting structures element. The specificity of the joining of materials completely excludes a violation of their structure and deformation. The attachment does not affect adjacent connections of other types. Small Cone on Rivet provide ease of installation. Used where it necessary to create a strong and reliable permanent joint of sheet materials. Widely used in construction, machine tool, mechanical engineering, when combining structures from steel and in agriculture machinery for strong fastening of elements from various materials. Firmly connects steel sheets, frame profiles and much more. 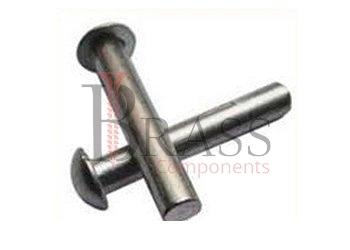 We manufacture DIN 124 Rivets as per Custom Specification and export in Germany, Spain, Netherlands, Portugal, UK and other European Countries. For more Information, Please Contact Us or Inquiry Now.